The range of applications of the rotary plug valve BR 33 corresponds to the "normal" globe control valve, but it can also be used for many special applications. 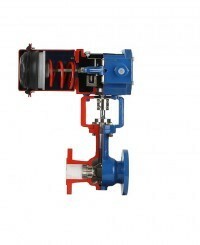 This valve is specifically used to regulate the flow of media containing solids in automated industrial installations. The rotary plug valve is especially useful for the control of flow under conditions with high probability of cavitation and erosion. The BR 33 also has high rangeability (200:1), enabling larger control ranges. With the Kvs-value adjustments integrated into the associated rotary actuator BR 99, it is possible to achieve different opening angles of the rotary plug valve, leading to larger Kvs-values without the need to swap out seats and plugs.